Do you believe it’s a mission impossible to find good quality Vegan Makeup Products? 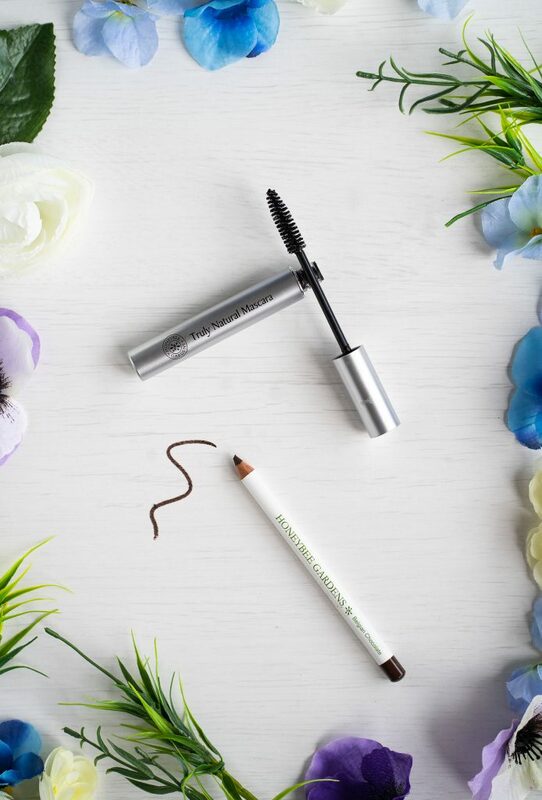 Here’s a list of 7 effective Brands that are Vegan and Certified Cruelty-Free. All of the products below can easily be found online for affordable prices. Special thanks to iHerb for sponsoring this post. All opinions are of course 100 % my own. This article is an honest review of products I received from iHerb and includes affiliate links. Living a vegan lifestyle has become more and more popular over the last few years. 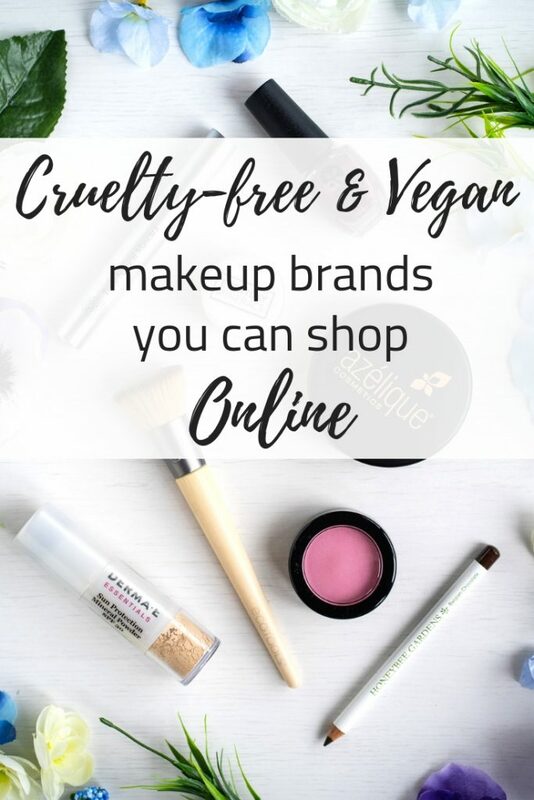 Makeup and beauty brands have started to pick up on that, and more and more brands have vegan products in their range. A lot of brands these days even choose to go full vegan. When is a Makeup Brand called Vegan? A makeup brand can’t just call itself vegan without good reason. There are a few criteria that they need to hit first. First up are the ingredients. Vegan Beauty and Makeup Brands won’t contain ingredients from animals or animal products. Beeswax for example is a common ingredient in a lot of natural beauty, skincare and makeup products. But as the name clearly suggests, beeswax is a wax made by bees. That makes it a product made by animals. Vegan brands will choose other alternatives. These ingredients are not necessarily better or more effective. A synthetic, chemical laden product can also be vegan by definition. But a lot of brands that care to go vegan will also be mindful of other factors. For example, they’ll use simple, hypoallergenic ingredients, reduce their waste during the production process, cut down on the use of plastic packaging or go for environmentally friendly options wherever possible. Because of animal cruelty, true vegan products can’t be tested on animals. A vegan brand should always be cruelty-free. But how do you check if a makeup brand is really cruelty-free? Sometimes brands will you use the word ‘vegan’ as a marketing stunt, to trick you into thinking their products are not tested on animals. There’s one important tell-tale: look for the bunny symbol on their packaging or website. But don’t just trust every bunny you see. There are only a few certified logos to prove that the brand has followed specific guidelines. Look for the Leaping Bunny Logo or Peta’s cruelty-free logo (the cute pink bunny face with the big ears). Check out this post from Cruelty Free Kitty to read more about this topic. Not testing the final product on animals is not enough though. Read the fine print on their website and find out if their ingredients are also not tested on animals. Everyday Minerals was founded in Austin, Texas, and focuses on using only essential, natural and ethically-sourced ingredients. They use eco-friendly and recyclable materials to package their handmade products. 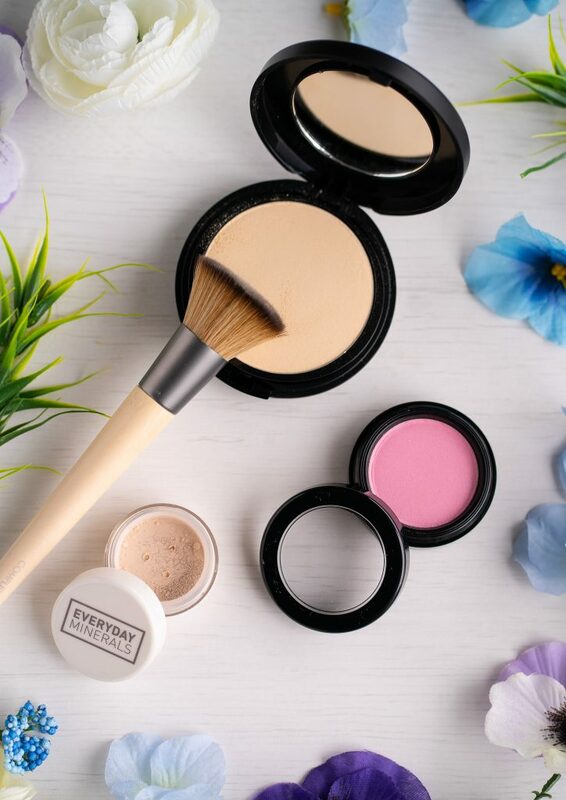 Everyday Minerals specializes in a whole range of powders, from color correctors to blushes and eye shadows. I tried their powder concealer. I go crazy with my concealers. I believe it’s the number one item you need to look more awake and brighten up your face. I had never tried a powder concealer before. I was surprised to see that it has such great coverage. I still like how dewy and fresh liquid concealer looks. I might use this to set the concealer for maximum coverage. I found it a little difficult to get enough powder out of the container. I might get rid of the separator and just dunk my finger or a brush directly into the powder instead. Real Purity has been around for 4 generations. Over the years, their focus on natural ingredients never changed. I decided to try out their powdered blush. Parfait is a beautiful pink shade, with great color pay off. It blended really smoothly on my skin. Real Purity is a very modest brand in my opinion. They don’t have excessive packaging for their products or their logo isn’t written across in big, bold lettering. Very real and pure indeed. EcoTools might be one of the better known brands in this list. They take their name very seriously. The handles for example are made from renewable bamboo. And their packaging is made with recycled aluminum and plastic. I choose a buffer brush from EcoTools to apply my powder foundation with. I love the sleek and simple design from the brush. It feels very nice in your hand as well. The flat top bristles picked up enough of the powder to work with and blended it smoothly onto my skin. Honeybee Gardens prides itself in using natural ingredients you can actually pronounce. Something I can only encourage. I’m always looking for the perfect black mascara, so I decided to try out their Truly Natural Mascara in Black Magic. The applicator has a wide brush and applies smoothly. It’s a good basic mascara that makes a great addition to any makeup kit. I was also in the market for a new eye liner and what sounds more divine than Belgian chocolate? It has a beautiful rich dark brown color and glides on easily. 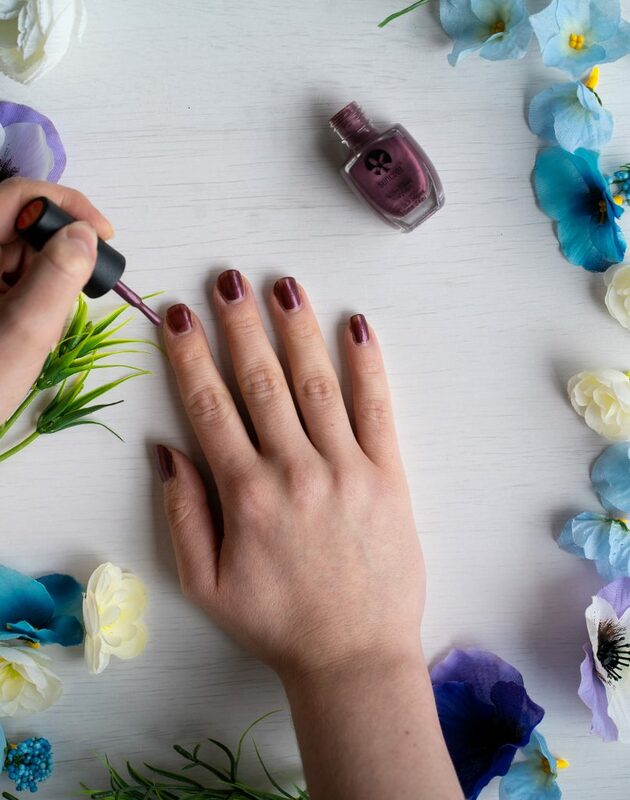 It all started with nail polishes for Canadian based brand Suncoat. formaldehyde, toluene and acetates. The result turned into a water-based, non-toxic nail polish. Its biggest selling point: this nail polish does not SMELL like other, chemical nail polishes. So you don’t have to worry about cracking open a window or doing touch ups in crowded places. Derma E started as a small business in Southern California. 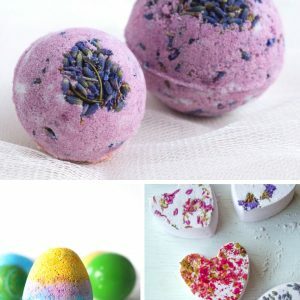 Aside from being a vegan and therefore cruelty free brand, their products also don’t contain parabens, sodium lauryl sulfates and mineral oil (among others). The ingredients used for their natural mineral sunscreens are nano-particle free and are considered safe for coral reef ecosystems, as chemical sunscreens are linked to harming these ecosystems (source). I don’t have to tell you anymore how important sunscreen is. And sun protection products are one of the few items I don’t recommend you DIY. When I go out on sun clad days I wear at least spf 50 as a base (hello, pale girl! ), and make touch ups a regular part of my routine. But when you’re wearing a full face of makeup, smearing sunblock on your face becomes challenging. That’s why this brush-on sunscreen powder will be my new favorite item this Spring and Summer. When you feel it’s time for a touch up, you can swipe the easy applicator across your face without worrying about ruining your makeup. Bonus: the powder will stop your face from going oily and keep it shine free throughout the day. 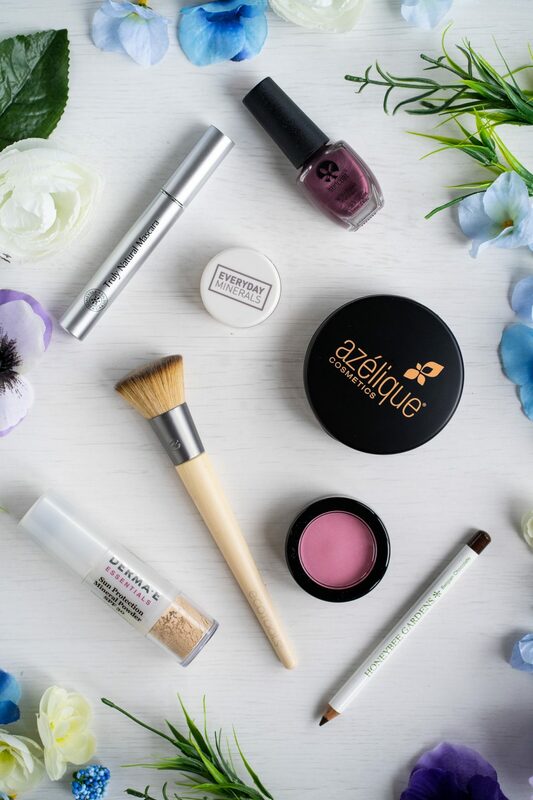 Azelique cosmetics are manufactured in the US. Along with a makeup range, they also have a skincare line. The Azelique Skincare Line is cruelty-free, but not vegan. 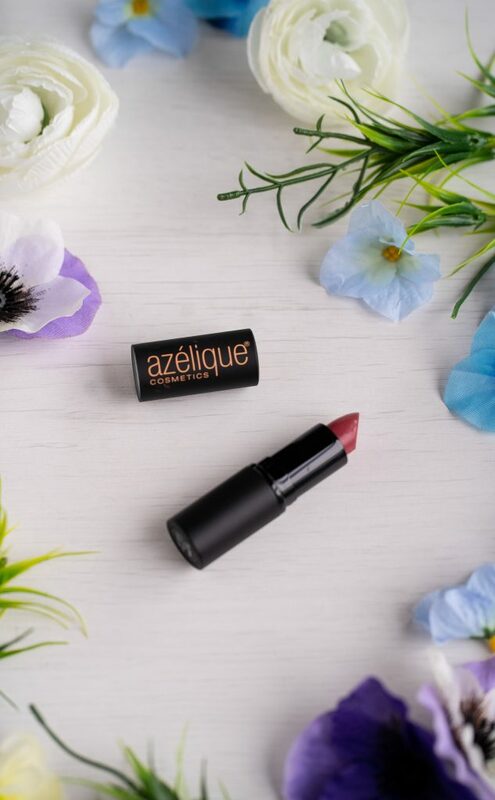 Azelique lipsticks are gluten free, which is important to know for people diagnosed with celiac disease or suffering from a gluten intolerance. The Go Pink shade that I tried is actually a very natural looking darker mauve pink. It dries with a matte finish and looks very classy. This might become my new favorite shade! I also tried their pressed powder foundation, as I had never tried powder foundations before. This brands was a really hit for me and I look forward to trying their other makeup items in the future! Where do you Buy Cruelty-Free Makeup Products? All of the Makeup Brands mentioned here can be easily bought online from iHerb. together in one place. They offer the best value for all your purchases with over 30 000 brand name natural products in their web shop. iHerb is a California based online superstore that you know will offer and ship good quality products. They guarantee delivery of your purchase and ship to over 150 countries around the world at very low shipping costs. You can simply choose the items you want from the comfort of your own couch and have them delivered right to your doorstep! I was impressed with how easy it was to order all of the items online. You just type in ‘Vegan’ or ‘Cruelty-free’ in the search bar and all the right brands pop up. Their shipping is fast, low cost and risk free. I know I’ll be ordering my next finds from iHerb again! 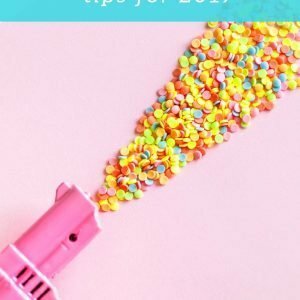 Make sure to pin this article for later! We should pay more attention to what we are buying…thank you for the explanation and tips about cruelty-free cosmetics!